Vote to Break the Link with New Labour! CWU members in the London Region are holding an indicative ballot over whether or not the union should continue to give money to the Labour party. This follows a myriad of attacks on the Royal Mail at the hands of Brown and Mandelson and a concerted attempt to push through the privatisation of the postal service. �In moving Composite 101 calling for support for the CNWP from The Welsh Valleys and Coventry Branch at the 2008 conference I referred to the number of motions and rule changes appearing on the agenda that were critical of Labour and made the point that this government has acted as viciously towards the trade unions and workers rights as had the Tories. 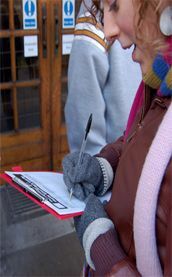 At the 2009 conference, the union leadership backed a resolution to ballot membership about withdrawing funds from New Labour if the government went ahead with privatising Royal Mail. This resolution was pushed to avoid an immediate discussion about disaffiliation, but its endorsement by conference was still an important step. New Labour is still ideologically committed to the privatisation of the postal service, as Peter Mandelson�s actions over the summer attest. However, in the face of the biggest economic crisis for generations, the big business bidders have temporarily dried up. Billy Hayes and the CWU leadership will undoubtedly use this as an excuse to further delay the vital debate about the CWUs political fund and how workers can most effectively further their interests. But we all know that attacks on our postal service continue, that a national agenda is being pursued to cut back services and attack the union, and that this is fully supported by New Labour. Whilst the issue of Royal Mail privatisation and Post Office closures are key issues for the CWU so too are the wider issues of the Anti-Union laws, privatisation, cuts In public spending, tuition fees, prescription charges, privatisation of NHS services and the lack of decent council housing. In addition, BT which was privatised by the Tories has been left in private hands under Labour to be run by fat cats resulting today in cuts in pensions for BT employees, the proposed loss of tens of thousands of jobs in the industry and a pay freeze just to add to the misery. Agency workers have been dismissed overnight with a weeks notice. Workers in the outsourced and divested sector face the same attacks in many cases from a weaker position as they struggle to retain union recognition. All this points to the fact that New Labour no longer represents the interests of working people. We need to break the link with Labour and make steps towards a new mass political party that can actually fight in our interest. The CWU London Region ballot could be an effective way to force this debate along and activists in the union should be campaigning for a strong vote to withdraw funding. This, along with initiatives being taken up by activists in other unions, could help prepare the ground for a working class electoral challenge to New Labour. Members of the PCS will shortly begin a consultation on backing trade union candidates in elections. The RMT backed the first ever all-Britain working class challenge to New Labour in the recent European elections and hopefully a similar trade union based electoral list will be put forward at the next general election. It seems the log-jam is beginning to break; CWU activists have an important role to play in this. Not one more penny to big-business Labour!